The purpose of this repository is to explore text classification methods in NLP with deep learning. Try bert model for multi-label classification, please check session #Models Detail, 3) Bert. Large Amount of Chinese Corpus for NLP Available! it has all kinds of baseline models for text classification. it also support for multi-label classification where multi labels associate with an sentence or document. it to performance toy task first. the model is independent from data set. several models here can also be used for modelling question answering (with or without context), or to do sequences generating. we explore two seq2seq model(seq2seq with attention,transformer-attention is all you need) to do text classification. you can cast the problem to sequences generating. performance hidden state update. it has ability to do transitive inference. Bert model achieves 0.368 after first 9 epoch from validation set. Transformer stand for model from 'Attention Is All You Need'. run python xxx_predict.py to do inference(test). Each model has a test method under the model class. you can run the test method first to check whether the model can work properly. use very few features bond to certain version. if you use python3, it will be fine as long as you change print/try catch function in case you meet any error. them as cache file using h5py. we suggest you to download it from above link. it contain everything you need to run this repository: data is pre-processed, you can start to train the model in a minute. hdf5, it only need a normal size of memory of computer(e.g.8 G or less) during training. it will use data from cached files to train the model, and print loss and F1 score periodically. old sample data source: if you need some sample data and word embedding per-trained on word2vec, you can find it in closed issues, such as: issue 3.
with single label; 'sample_multiple_label.txt', contains 20k data with multiple labels. input and label of is separate by " label". step 1: you can read through this article. you will get a general idea of various classic models used to do text classification. step 2: pre-process data and/or download cached file. set. there are a list of things you can try at the end of this jupyter. b. download zip file that contains cached files, so you will have all necessary data, and can start to train models. step 3: run some of models list here, and change some codes and configurations as you want, to get a good performance. record performances, and things you done that works, and things that are not. competition, and apply it with what you've learned. representing there are three labels: [l1,l2,l3]. between part1 and part2 there should be a empty string: ' '. Some util function is in data_util.py; check load_data_multilabel() of data_util for how process input and labels from raw data. there is a function to load and assign pretrained word embedding to the model,where word embedding is pretrained in word2vec or fastText. or you can turn off use pretrain word embedding flag to false to disable loading word embedding. after embed each word in the sentence, this word representations are then averaged into a text representation, which is in turn fed to a linear classifier.it use softmax function to compute the probability distribution over the predefined classes. then cross entropy is used to compute loss. bag of word representation does not consider word order. in order to take account of word order, n-gram features is used to capture some partial information about the local word order; when the number of classes is large, computing the linear classifier is computational expensive. so it usehierarchical softmax to speed training process. result: performance is as good as paper, speed also very fast. In order to get very good result with TextCNN, you also need to read carefully about this paper A Sensitivity Analysis of (and Practitioners' Guide to) Convolutional Neural Networks for Sentence Classification: it give you some insights of things that can affect performance. although you need to change some settings according to your specific task. Convolutional Neural Network is main building box for solve problems of computer vision. Now we will show how CNN can be used for NLP, in in particular, text classification. Sentence length will be different from one to another. So we will use pad to get fixed length, n. For each token in the sentence, we will use word embedding to get a fixed dimension vector, d. So our input is a 2-dimension matrix:(n,d). This is similar with image for CNN. Firstly, we will do convolutional operation to our input. It is a element-wise multiply between filter and part of input. We use k number of filters, each filter size is a 2-dimension matrix (f,d). Now the output will be k number of lists. Each list has a length of n-f+1. each element is a scalar. Notice that the second dimension will be always the dimension of word embedding. We are using different size of filters to get rich features from text inputs. And this is something similar with n-gram features. Secondly, we will do max pooling for the output of convolutional operation. For k number of lists, we will get k number of scalars. Thirdly, we will concatenate scalars to form final features. It is a fixed-size vector. And it is independent from the size of filters we use. Finally, we will use linear layer to project these features to per-defined labels. pre-train the model by using one kind of language model with huge amount of raw data, where you can find it easily. as most of parameters of the model is pre-trained, only last layer for classifier need to be need for different tasks. a short period of time. tasks to pre-train the model. based on this masked sentence. masked words are chosed randomly. positions to predict what word was masked, exactly like we would train a language model. source_file each line is a sequence of token, can be a sentence. prediction is a sample task to help model understand better in these kinds of task. 50% of chance the second sentence is tbe next sentence of the first one, 50% of not the next one. basically, you can download pre-trained model, can just fine-tuning on your task with your own data. for classification task, you can add processor to define the format you want to let input and labels from source data. 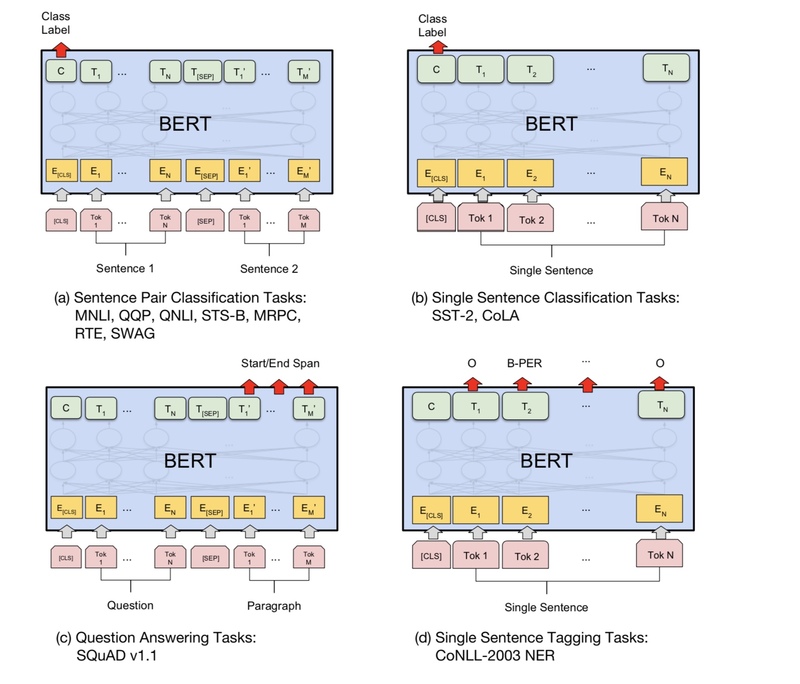 Use BERT for multi-label classification? you can use session and feed style to restore model and feed data, then get logits to make a online prediction. originally, it train or evaluate model based on file, not for online. How to get better model for BERT? your task, then fine-tuning on your specific task. thirdly, you can change loss function and last layer to better suit for your task. additionally, you can add define some pre-trained tasks that will help the model understand your task much better. Structure same as TextRNN. but input is special designed. e.g.input:"how much is the computer? EOS price of laptop". where 'EOS' is a special token spilted question1 and question2. Structure: first use two different convolutional to extract feature of two sentences. then concat two features. use linear transform layer to out projection to target label, then softmax. for left side context, it use a recurrent structure, a no-linearity transfrom of previous word and left side previous context; similarly to right side context. In NLP, text classification can be done for single sentence, but it can also be used for multiple sentences. we may call it document classification. Words are form to sentence. And sentence are form to document. In this circumstance, there may exists a intrinsic structure. So how can we model this kinds of task? Does all parts of document are equally relevant? And how we determine which part are more important than another? 2)it has two levels of attention mechanisms used at the word and sentence-level. it enable the model to capture important information in different levels. Word Encoder: For each words in a sentence, it is embedded into word vector in distribution vector space. It use a bidirectional GRU to encode the sentence. By concatenate vector from two direction, it now can form a representation of the sentence, which also capture contextual information. Word Attention: Same words are more important than another for the sentence. So attention mechanism is used. It first use one layer MLP to get uit hidden representation of the sentence, then measure the importance of the word as the similarity of uit with a word level context vector uw and get a normalized importance through a softmax function. Sentence Encoder: for sentence vectors, bidirectional GRU is used to encode it. Similarly to word encoder. Sentence Attention: sentence level vector is used to measure importance among sentences. Similarly to word attention. Generally speaking, input of this model should have serveral sentences instead of sinle sentence. shape is:[None,sentence_lenght]. where None means the batch_size. In my training data, for each example, i have four parts. each part has same length. i concat four parts to form one single sentence. the model will split the sentence into four parts, to form a tensor with shape:[None,num_sentence,sentence_length]. where num_sentence is number of sentences(equal to 4, in my setting). 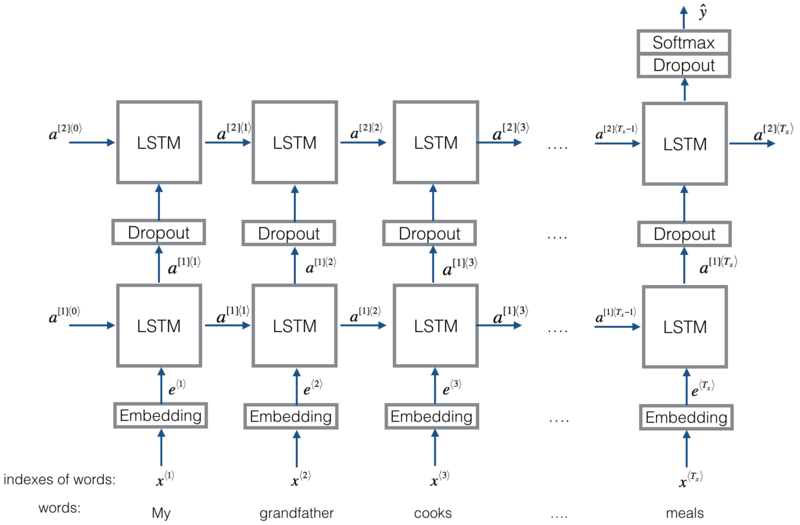 1)embedding 2)bi-GRU too get rich representation from source sentences(forward & backward). 3)decoder with attention. there are two kinds of three kinds of inputs:1)encoder inputs, which is a sentence; 2)decoder inputs, it is labels list with fixed length;3)target labels, it is also a list of labels. for example, labels is:"L1 L2 L3 L4", then decoder inputs will be:[_GO,L1,L2,L2,L3,_PAD]; target label will be:[L1,L2,L3,L3,_END,_PAD]. length is fixed to 6, any exceed labels will be trancated, will pad if label is not enough to fill. calculate similiarity of hidden state with each encoder input, to get possibility distribution for each encoder input. weighted sum of encoder input based on possibility distribution. when it is training, another RNN will be used to try to get a word by using this "thought vector" as init state, and take input from decoder input at each timestamp. decoder start from special token "_GO". after one step is performanced, new hidden state will be get and together with new input, we can continue this process until we reach to a special token "_END". we can calculate loss by compute cross entropy loss of logits and target label. logits is get through a projection layer for the hidden state(for output of decoder step(in GRU we can just use hidden states from decoder as output). when it is testing, there is no label. so we should feed the output we get from previous timestamp, and continue the process util we reached "_END" TOKEN. for vocabulary of lables, i insert three special token:"_GO","_END","_PAD"; "_UNK" is not used, since all labels is pre-defined. we do it in parallell style.layer normalization,residual connection, and mask are also used in the model. For every building blocks, we include a test function in the each file below, and we've test each small piece successfully. Sequence to sequence with attention is a typical model to solve sequence generation problem, such as translate, dialogue system. most of time, it use RNN as buidling block to do these tasks. util recently, people also apply convolutional Neural Network for sequence to sequence problem. Transformer, however, it perform these tasks solely on attention mechansim. it is fast and achieve new state-of-art result. 6 layers.each layers has two sub-layers. the first is multi-head self-attention mechanism; the second is position-wise fully connected feed-forward network. for each sublayer. use LayerNorm(x+Sublayer(x)). all dimension=512. The decoder is composed of a stack of N= 6 identical layers. In addition to the two sub-layers in each encoder layer, the decoder inserts a third sub-layer, which performs multi-head attention over the output of the encoder stack. Similar to the encoder, we employ residual connections around each of the sub-layers, followed by layer normalization. We also modify the self-attention sub-layer in the decoder stack to prevent positions from attending to subsequent positions. This masking, combined with fact that the output embeddings are offset by one position, ensures that the predictions for position i can depend only on the known outputs at positions less than i.
multi-head self attention: use self attention, linear transform multi-times to get projection of key-values, then do ordinary attention; 2) some tricks to improve performance(residual connection,position encoding, poistion feed forward, label smooth, mask to ignore things we want to ignore). Here we only use encode part for task classification, removed resdiual connection, used only 1 layer.no need to use mask. we use multi-head attention and postionwise feed forward to extract features of input sentence, then use linear layer to project it to get logits. Input:1. story: it is multi-sentences, as context. 2.query: a sentence, which is a question, 3. ansewr: a single label. by using bi-directional rnn to encode story and query, performance boost from 0.392 to 0.398, increase 1.5%. a. compute gate by using 'similiarity' of keys,values with input of story. b. get candidate hidden state by transform each key,value and input. c. combine gate and candidate hidden state to update current hidden state. b. get weighted sum of hidden state using possibility distribution. c. non-linearity transform of query and hidden state to get predict label. use blocks of keys and values, which is independent from each other. so it can be run in parallel. modelling context and question together. use memory to track state of world; and use non-linearity transform of hidden state and question(query) to make a prediction. simple model can also achieve very good performance. simple encode as use bag of word. under this model, it has a test function, which ask this model to count numbers both for story(context) and query(question). but weights of story is smaller than query. 3.Episodic Memory Module: with inputs,it chooses which parts of inputs to focus on through the attention mechanism, taking into account of question and previous memory====>it poduce a 'memory' vecotr. 4.Answer Module:generate an answer from the final memory vector. use an attention mechanism and recurrent network to updates its memory. two-layer feed forward nueral network.input is candidate fact c,previous memory m and question q. features get by take: element-wise,matmul and absolute distance of q with c, and q with m.
b.memory update mechanism: take candidate sentence, gate and previous hidden state, it use gated-gru to update hidden state. like: h=f(c,h_previous,g). the final hidden state is the input for answer module. c.need for multiple episodes===>transitive inference. e.g. ask where is the football? it will attend to sentence of "john put down the football"), then in second pass, it need to attend location of john. 4.Answer Module: take the final epsoidic memory, question, it update hidden state of answer module. What is most important thing to reach a high accuracy? It depend the task you are doing. From the task we conducted here, we believe that ensemble models based on models trained from multiple features including word, character for title and description can help to reach very high accuarcy; However, in some cases,as just alphaGo Zero demonstrated, algorithm is more important then data or computational power, in fact alphaGo Zero did not use any humam data. Is there a ceiling for any specific model or algorithm? The answer is yes. lots of different models were used here, we found many models have similiar performances, even though there are quite different in structure. In some extent, the difference of performance is not so big. Is case study of error useful? I think it is quite useful especially when you have done many different things, but reached a limit. For example, by doing case study, you can find labels that models can make correct prediction, and where they make mistakes. And to imporove performance by increasing weights of these wrong predicted labels or finding potential errors from data. How can we become expert in a specific of Machine Learning? In my opinion,join a machine learning competation or begin a task with lots of data, then read papers and implement some, is a good starting point. So we will have some really experience and ideas of handling specific task, and know the challenges of it. But what's more important is that we should not only follow ideas from papers, but to explore some new ideas we think may help to slove the problem. For example, by changing structures of classic models or even invent some new structures, we may able to tackle the problem in a much better way as it may more suitable for task we are doing.